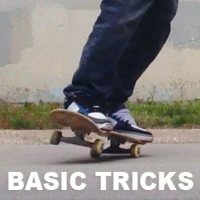 What are the basic skateboard tricks? They are the tricks that everyone can do soon after stepping on a board. Like rolling and turning. The foundation of skateboarding is rolling. Let's spend some time getting good at that. Rolling is what makes all the other tricks fun. Doing your tricks with some speed will step up your game. So don't skip to more advanced tricks until you have a solid balance rolling on your board. Everyone wants to ollie and drop in but they are not the best tricks to try first. Check out these basics that will get you ready for more difficult maneuvers. Learn these and have fun with new tricks without the wait. You can zip around the streets or park while others are standing in one place. Learn how to ride your skateboard first! It sounds simple but most people forget this point. You will see people standing in one place. Trying to do tricks when they can’t even roll on their skateboard. What hope do you have landing a trick if you can’t roll on your skateboard? If you have never stepped on a skateboard try these easy skateboard tricks first. These tricks may not be the hottest but you can learn them quicker and have fun doing them. While other skaters fall trying tricks that are too difficult. You will be skating around the park with ease. Plus learning these tricks first will make it way easier to land the hot ones. Okay. If you can do this stuff it is time to move on to most wanted skateboard tricks. These tricks are cool ones that most skaters want to do. I warn you, if you jump here too early you will be missing on a lot of fun ripping. If you can do these tricks you are pretty good skater. Better than most. Building this foundation of basics first is more fun. You are learning and landing new tricks all the way through. Now that you are ready for the advanced tricks. They will come easy to you.